Goicha Suda and Shinji Mikami, the creative forces behind the likes of Killer 7 and the Resident Evil games, have put together a stylish and overtly adult take on the action-based survival horror formula. While Grasshopper's new game owes a lot to Resident Evil 4 in terms of the raw gameplay mechanics, it also takes inspiration from a variety of other notable sources - Sam Raimi's Evil Dead movies and Robert Rodriguez's Grindhouse both spring to mind, along with Sega and Namco's modest light gun hit, Vampire Night, which has some passing similarities in terms of its overall mood and colour scheme. Despite being powered by Unreal Engine 3 middleware, Shadows of the Damned strongly defines its own unique look and feel, but other elements of the production are very much in keeping with the standard look we've come to expect from a great many UE3 titles. The shiny look of the characters and the heavily normal mapped nature of the environments are common staples of the tech. However, what separates the game from other releases is the various post processing elements which give the game its gritty, b-movie movie appearance. Various filters add softness to the overall presentation, while the likes of depth of field and camera motion blur layers the visuals in such a way as to bring even more of a cinematic atmosphere to the proceedings. As we've seen with many recent UE3-based titles, both Xbox 360 and PlayStation 3 versions of the game are very solid indeed. Grasshopper Manufacture has produced a graphically accomplished title, held up as much by the stylised art and design choices as it is by its technical foundations. In terms of the multi-platform conversion aspect, there are tangible plus points on both consoles, but on the whole it is the PS3 game which appears to be the more pristine of the two, even if it isn't quite as strong in terms of overall performance - a relatively minor blip we'll address later. A roll-out of our extensive Shadows of the Damned comparison gallery and our head-to-head video below reveals several differences worthy of comment. There are no surprises in store for us with regards to the basic visual make-up of the game: Grasshopper offers up a native 720p image with no anti-aliasing on the Xbox 360 and PlayStation 3 - pretty much the standard for Unreal Engine 3 in recent times. Thankfully, the style of the artwork and the dark, low contrast nature of the game combined with the heavy use of post-processing effects diminishes many of the aliasing issues. However, the reliance on these effects does have some impact on overall image quality in that the visuals tend to look slightly softer as a result. That said, we do find that the clarity and detail of the final image is given a tangible boost on the PlayStation 3 release. Higher levels of anisotropic filtering applied to the textures gives us a crisper overall presentation, while also delivering additional depth to the scene. On the other hand, the 360 gets a subtle post-processing advantage on the form of a camera-based motion blur effect. Texture filtering is clearly superior on PS3, giving a sharper image in places. Curiously, camera-based motion blur is absent though, appearing only on the 360 game. As with the vast majority of Unreal Engine titles, the baseline look of the game is very closely matched on both consoles and as you would expect the core art assets are effectively identical throughout. In our extensive comparison gallery - and in some of the shots on this page - you might notice what looks like pared back texture details on both versions at various points. But in reality this has more to do with the game having a few asset-streaming and LOD (level of detail) issues than anything else: again, standard fare for the UE3 tech. Interestingly, despite the lack of mandatory install, it is the PlayStation 3 version that manages to stream in new art more quickly. The result is that the game feels more polished and solid on the Sony platform during gameplay: textures stream in with no fuss and are mostly displayed on cue, while on 360 the final high quality art is often still being loaded in as you play, leaving some rather plain, low resolution textures in full view. On the other hand, when it comes down to the cut-scenes the opposite is true - it is the PS3 that is behind with regards to mip-map transitions taking place. Light shafts were only seen in the Xbox 360 version of Bulletstorm - one of the latest Unreal Engine 3 enhancements. With Shadows of the Damned we see the same effect on both systems. 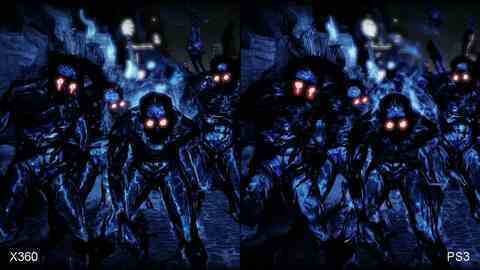 Moving on, one of the most notable visual aspects of Shadows of the Damned is its heavy reliance on post-processing to deliver additional atmosphere and style to the proceedings, along with the plentiful use of various dynamic light sources, which are integral to the core gameplay mechanics. Light and shadow doesn't just enhance the look of the world around you, but it is also used as an important gameplay device. Darkness covers the environment in a purple haze of energy, slowly sucking the life out of your character, while also shielding enemies from regular attacks.